Although famous for its intimidating steeps and challenging hike-to terrain, Telluride is also home to endless cruisers and mellow off-piste options perfect for skiers of any ability level. Do you dream about crushing fresh powder down steep, tightly-spaced couloirs? Check. How about endless tree runs down North facing slopes that hold snow for weeks? Check. Or maybe you like gentle, groomed cruisers that slowly wind their way through the gorgeous mountains for miles? Check, too. Telluride Ski Resort truly is a tale of two mountains. The aspects facing the town of Telluride and the ridgelines running toward Palmyra Peak hold some of North America’s most desirable lines and catch the brunt of snowfall from storms. The continued expansion of hike-to terrain and the addition of the Revelation Bowl chairlift have worked to spread expert skiers across the mountain and keep conditions great. With a vertical drop of more than 4,000 feet top to bottom, Telluride is the perfect fit for the powder-chasing adrenaline junky. In contrast, the Mountain Village aspects are family-friendly and provide gentle slopes great for beginners. The attitude here is laid-back, and skiers zigzag down mile-long runs at their own pace. Several intermediate chairs link the beginner and expert terrain, making Telluride Ski Resort, Colorado, a great place to learn to ski or improve your skills. Telluride has 2,000 acres of in-bounds terrain. The longest run, Galloping Goose, is 4.6 miles. 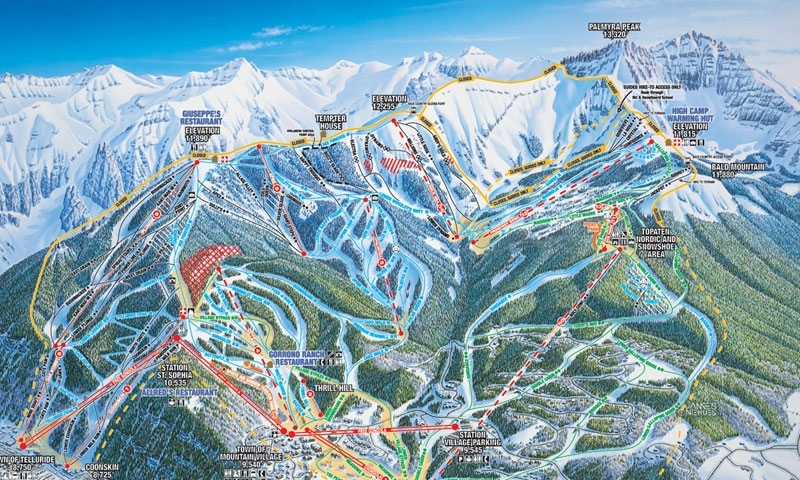 There are 18 lifts, with 2 high-speed gondolas and 7 high-speed quads. The vertical drop is 4,425 feet, with 3,845 feet lift-served. The base area elevation is 8,725 feet, and the resort reaches a maximum of 13,150 feet. Average annual snowfall is 309 inches. Telluride resort services offers guided snowshoeing and backcountry guides through its Eco Adventures center. Call 970-728-7300 for more information. Telluride has seven on-mountain restaurants. The Gorrono Ranch is a popular spring destination because of its large deck and live music. Look for it underneath Lift 4 in Mountain Village. With its wide-selection of craft beer, The Hop Garden is a favorite Après-ski spot at the base of Lift 4 and the gondola. For fine-dining and spectacular views of the Telluride valley, book ahead at Allred’s, located at the top of the gondola. For a quick soup and sandwich while on skiing, head to Giuseppe’s near the top of Lift 9. Both base areas are home to several rental businesses and full service ski shops. Call 800-778-8581 or E-mail at info@tellurideskiresort for more information.